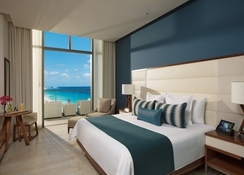 An uber chic, adults-only hotel with contemporary décor, Secrets the Vine Cancun is fringed by the azure waters of the Caribbean Sea and the white sandy beaches of Cancun. It combines the natural beauty of Yucatan Peninsula with the modern amenities of a luxury hotel and offers its guests an all inclusive stay. Over 400 rooms and suites are detailed with Italian porcelain floors and teak wood furniture to ensure a comfortable yet elegant stay for all its guests. 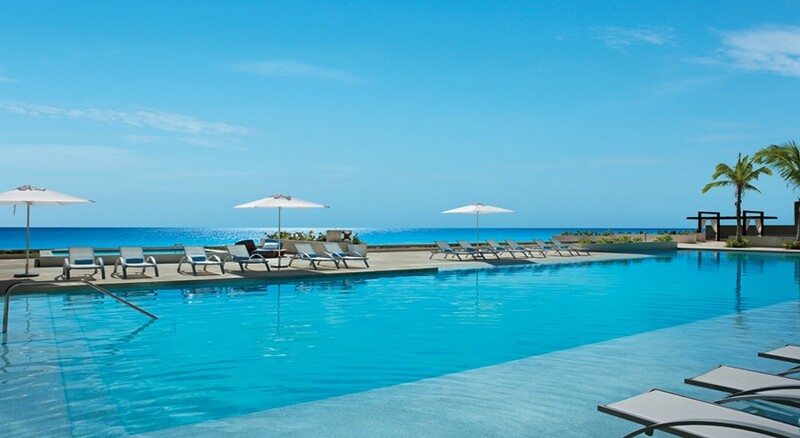 Secrets the Vine Cancun boasts three infinity pools and an outdoor whirlpool, a sumptuous spa and fitness centre, yoga on the beach, salsa lessons and plenty of watersports activities, suitable for guests of all ages. The hotel’s all-inclusive package includes access to the finest restaurants and bars, domestic and international top-shelf spirits and soft drinks, 24-hour room service, concierge service and pool & beach wait service. Free access to unlimited daytime activities, night entertainment, themed parties and nightclubs are also included in the package. 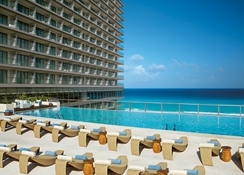 Secrets the Vine Cancun is located on the easternmost tip of Mexico, right on the beachfront. The other resorts of the same group are also located nearby. The Cancun International Airport is about 17.7km from the hotel. Downtown Cancun is about 18.7km. Just outside the hotel, guests would find a host of restaurants and bars. The hotel has a total of 497 non-smoking rooms and suites complete with Italian porcelain tiles and teakwood furniture. 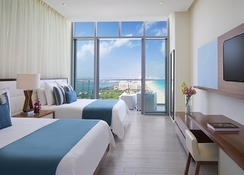 All rooms feature one King-sized or two Queen-sized beds with custom headboards, a sleek private terrace, a luxury bathroom made entirely out of white glass, a complimentary mini-bar and much more. All rooms have fascinating views of the ocean. The various categories of rooms and suites are: Deluxe Ocean View, Junior Suite Ocean View, Honeymoon Suite Ocean View, Honeymoon Suite Ocean Front, Master Suite Ocean View and Master Suite Ocean Front. If you are a preferred club room member, you can opt for Preferred Club Deluxe Ocean View, Preferred Club Junior Suite Ocean View, Preferred Club Honeymoon Suite Ocean View, Preferred Club Honeymoon Suite Ocean Front, Preferred Club Master Suite Ocean View, Preferred Club Master Suite Ocean Front, Preferred Club Governor Suite and Preferred Club Presidential Suite. 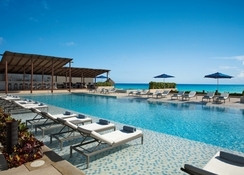 There are seven restaurants at Secrets the Vine Cancun. Market Cafe is the hotel’s main buffet restaurant open for breakfast, lunch and dinner. Nebbiolo is an Italian restaurant open for dinner. Dragons is a specialty Asian fusion restaurant open for dinner. Olio is a Mediterranean-style restaurant. Sea Salt Grill serves International favourites. Bluewater Grill is a premium steak-house restaurant open for dinner. Barefoot Grill is a poolside restaurant and serves grilled snacks. The Vine Bazaar is a café that is open 24-hours and specializes in premium coffee and snacks. 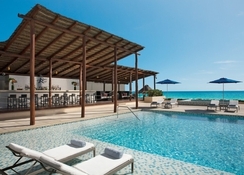 The hotel also has seven bars, including a pool bar, a lobby bar, a beach bar, a piano and a wine cellar/bar. 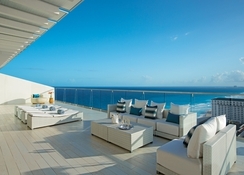 There are three infinity swimming pools and jacuzzis overlooking the Caribbean Sea. Fully equipped fitness centre and Secrets Spa by Pevonia, which offer a range of treatments and therapies at an extra charge, are other attractions here. The hotel conducts yoga and meditation classes, wine tastings, cooking & dance lessons and water aerobics. Fitness activities include beach and pool volleyball, football, table tennis and billiards. Other attractions include movie on the beach, snorkelling and golfing. Regular evening entertainment including live shows and theme parties. One of the best hotels I been too! Amazing beach, great food, great service and hotel club is good. Premium drinks and great hospitality! Mostly American tourists, I was one of the very few British tourists but I prefer it that way!